The X/Y axis competitive analysis slide is a used by existing companies who plan to enter into an existing market. In this case the basis of competition on the X/Y axes are metrics defined by the users in the existing market. This slide typically shows some price/performance advantage. And in the days of battles for existing markets that may have sufficed. But today most startups are trying to ressegment existing markets or create new markets. How do you diagram that? What if the basis of competition in market creation is really the intersection of multiple existing markets? Or what if the markets may not exist and you are creating one? I’ve always thought of my startups as the center of the universe. So I would begin by putting my company in the center of the slide like this. Then they filled in the market spaces with the names of the companies that are representative players in each of the adjacent markets. What the chart is saying is, “we think our customers will come from these markets.” That’s handy if you’re using a Lean Startup methodology because the Petal Chart helps you identify your first potential customer segments on the business model canvas. You use this chart to articulate your first hypotheses of who are customers segments you’re targeting. If your hypotheses about the potential customers turn out to be incorrect, and they aren’t interested in your product, then you go back to this competitive diagram and revise it. Those investors have a bright future in banking rather than venture capital. Seriously, I would run away fast from a potential investor who doesn’t or can’t understand that visualizing the data doesn’t increase or decrease the likelihood of success. It only provides a better way to visualize potential customer segments. Steve you did it again! What a great way to communicate a startups position and opportunity in a subtle but very compelling way. This will come in handy as we’re raising capital in 3-6 months. Thank you! Sweet, thank you Steve – very helpful and yet specific and actionable and leaves room for testing and options for entering other markets. You’ve just solved a huge conundrum that has left us scratching our heads for weeks. That’s opened up a lot of new avenues, thanks. Oh and thanks too for The Startup Manual, which we’re using as our Bible. Steve – this article is fantastic. Creating the visual for the markets that Contract Cloud can create/enter is incredibly helpful. THANK YOU! Nice. I think Edward Tufte would love this. This is such a great way to graphically represent the market. You provide very clear instructions as well. Much appreciated as I prepare a growth plan which involves new technology for my market. Our clients come from such a diverse number of markets I often find it difficult to explain to others or figure this out. Your way of representing this makes it quick for investors to see the opportunity. I don’t think this would convince investors to give you money. It visually implies that your little startup is going to get crushed from all sides. Interesting point. I guess it depends on whether the glass is half full or empty. By including several different petals the diagram does imply there are several essential ingredients to success in the new market. Strategy is defined not only by what you do, but also by what you don’t do. Including elements from another market that would be disruptive to your opponent could be a good defense, and this visualization should make that obvious. Actually this diagram is why bankers don’t finance new ventures. To a banker it looks like you’re going to get crushed. I can see both sides of the argument and its hard to know how your potential VC will react. To be safe, i’d follow this diagram immediately with a summary of how my start-up is differentiated from these sectors. Each adjacent sector will have its shortcomings and benefits, so a convincing argument would then go on to explain why consumers would jump segment. Perhaps a model similar to the Blue Ocean Strategy Canvas (http://strategycanvas.org/#/edit/Alu1QqGeVM) would be well placed to follow up the Petal Diagram in a presentation? Exactly – this is a great way to visualize and explain the market oppprtunity. Differentiaton / competitive advantage should be emphasized separately. COMPLETELY Disagree. If what you’re doing is a novel and unaddressed product that the other business segments are addressing, BUT not as focused as your product, it very eloquently visually describes the opportunity. Steve–This is an interesting picture. I particularly like the views that combine words, pictures and numbers. Given the names shown, perhaps these other petals on the diagram are “resources” for lifelong learning rather than competitors. 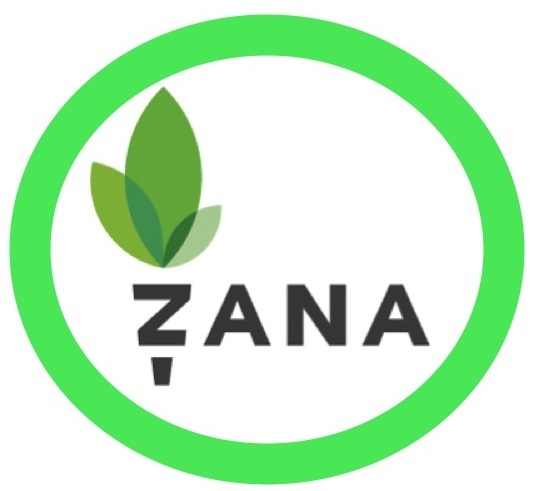 Is Zana the network that qualifies the resources and directs its customers to the appropriate ones? If so, a network picture might be more effective. Murphy’s Law of Miscommunication says that “If it can be misunderstood, it will be,” so a little more guidance on the diagram would be appreciated. This is awesome, and very timely for me. Any chance you could turn us on to a tool to build the diagram? This is awesome Steve. Great way to show competitive analysis. I think there’s something to be said for a lack of visual clarity in what the diagram is representing — it may work better when it can be explained in person, rather than, say, sent to someone via email. I’d like to second the call for a tool to create this. Even if I could free-hand draw it, which I can’t, that doesn’t get the diagram onto a PowerPoint. I built a petal diagram for my business after reading this article. Happy to share an empty version in response to the many who have asked for a tool/template. I made mine as a 6 petal diagram using only standard powerpoint shapes. Adjusting colors, petals, size, etc is pretty simple. To me it looks like a great way to show market potential and where customers will come from, rather than about competition. Because, as mentioned at the beginning of the article, there is no market that exists, so there is no competition. This is one of the best articles I’ve ever seen on market investment. It’s clear, concise, and to the point. The “Petal” illustration provided is refreshingly new and it is almost perfect. The only thing I might add is a final slide on the “why” of everything regarding brand or company positioning against any specific competitor or segment. Knowing the size of a market and its investment return potential always comes first. But then you have to know “why” consumers or customers from the variously identified verticals or segments of opportunity would switch from their current brand or company and go to yours. This is where we logically evolve from pure finance and jump into marketing, because brand positioning, promise, and “reasons why” for believing ultimately make or break the selling proposition and ROI. The typical marketing keys to this final part of the evaluation process are: 1) Identifying the various competitive brand positions currently held in the eyes of the consumer (“positioning” being the place or space a brand actually holds in the consumer’s mind, rather than what you think or desire your positioning to be); 2) Given this, mapping out the competitive landscape in such terms and where your brand fits in to fill a relevant need/want gap; and 3) Assessing the competitive strengths and weaknesses of those competitors relative to your brand in terms of marketing dollar support, pricing, positioning, distribution, etc. In this final phase of the investment process, I personally would opt for classic quadrant analyses measuring and mapping all the variables – be it through multiple regression, conjoint, or some other model. At the same time, I must say, these quantitative methods are expensive. So, in lieu of that, I think the “Petal” model might suffice – realizing that such evaluations would be qualitative, highly dependent on management’s subjective interpretation, and not a true reflection of the marketplace from a consumer perspective. Maybe some Google algorithm might help in this case. Altogether, it means writing a marketing plan that identifies all of the aforementioned; states clearly defined brand sales or market share objectives; the specifics strategies to achieve them; and tactics employed to facilitate execution of the total plan. Bingo! I started reading this post (and saw the X/Y Axis) and said “Wait a minute, my Competitive Analysis slide looks more like flower petals with my company in the middle…” 🙂 Totally agree about running away from investors who are scared off or don’t get this. I think the XY graph model is definitely limited in dimensions of clarity or detail for customer development purposes and feel your petal diagram is a very important alternative visualizing method for customer discovery and validation as many founders today don’t do enough to care who their customers are or their competitors are and end up failing because of a simple lack of understanding of the market. Thanks Steve for the wonderful insights. 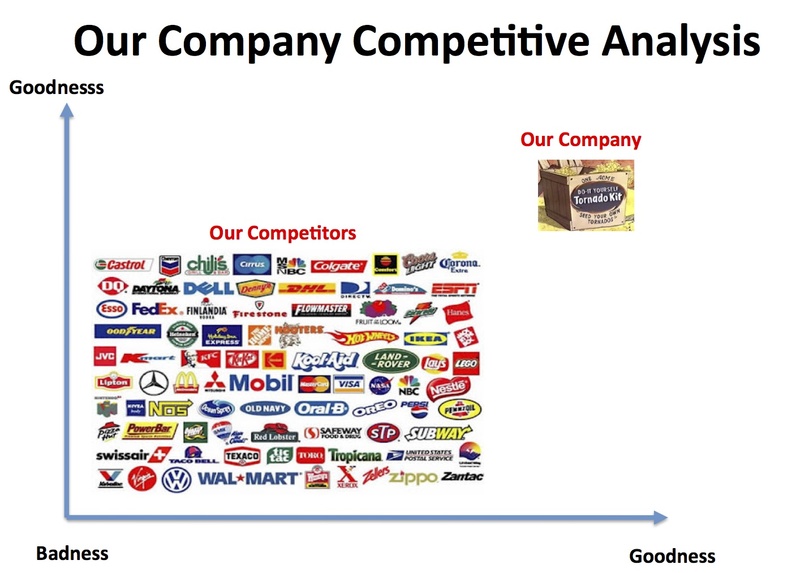 Sorry, this is a market analysis (segmentation, sizing, ..) not a competitive analysis.. Purpose of comp. analysis is to answer “how are we different from existing solutions” which the petal diagram does not address. Furthermore, it confuses potential competitors with possible partners. Yes, Steve says the purpose of the petal diagram is to convey the customer segments you’re targeting. It’s doing so through the lens of existing product categories that overlap with the new one you’re creating. You’ll tap into these established customer bases to acquire customers for your offering. If your purpose is to analyze the competitive landscape, and to find the new category and unique value proposition, I suggest using a competitive mindshare map. It forces you to consider the value of your product in terms of the limited territory you can capture and hold in the mind of the prospect, relative to competitors. Steve – I agree that most competition slides are hopeless. But, I’m struggling with this visualization. Maybe it’s years of Venn diagrams that make me think this is intersection. Not really. It’s not like you draw customers from those markets. 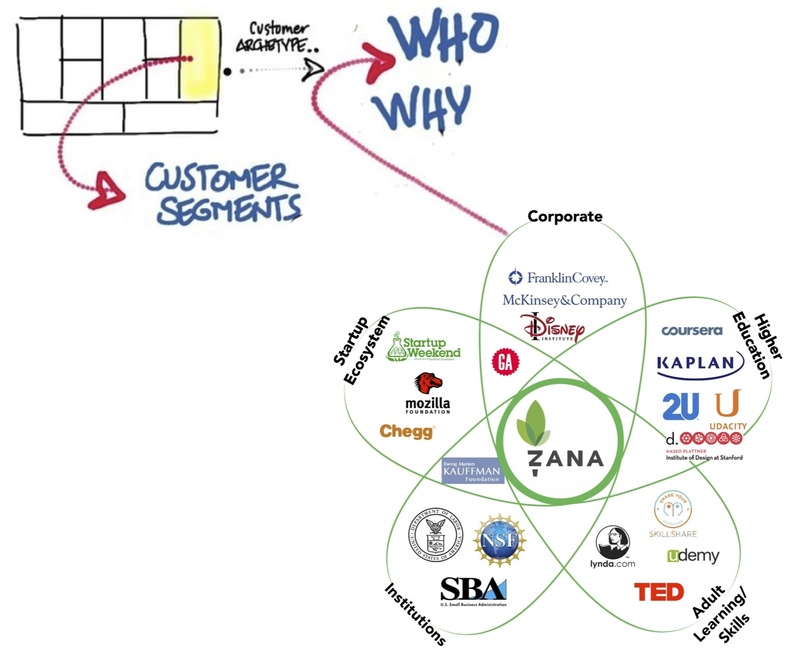 Instead, the customers (entrepreneurs) need Zana but are not currently served by other solutions. They are an island not reached by the competitors or poorly served by them. It would be good to put a dollar number for market size on Zana in that it’s not clear how big the intersection would be. As several other commenters have said, it would also be good to say why they don’t serve this audience. I.e., if someone put content for entrepreneurs on Udacity, this is why that’s not sufficient. I’m literally in the middle of trying to do this for a startup, but right now the petal diagram would be a bad call in my mind. Competition for startups that are disrupting a large market is like getting into a crowded bar fight with the lights off. It is not a pretty scene. It does not fit into quadrants or flowers. And, as in a bar fight, its not about categorizing brawlers, its about how you are going to beat the crap out of them. Actually any sensible investor would find huge value in such a visualization for its holistic positioning … but venture capitalists are looking more and more like they come from a different planet. I like the simplicity and visual attractiveness of Steve Blank’s Petal Diagram. However, many of Steve’s criticisms relate to poor visualization and construction of the X/Y-Competitive Graph. For over 10 years I’ve been using a form of the Classic Competitive Graph which overcomes all of the limitations that Steve mentions above. To show similarities and differences between Steve’s Petal Diagram and my Trade-off Map (which is an alternative and information-rich presentation of the Competitive Graph), I’ve presented on the Trade-off Map the information which Steve featured on the example of the Petal Diagram; see http://goo.gl/8TKHm4. In this way, one can see the strengths and weaknesses of the Petal Diagram as well as the Trade-off Map (reinvented Competitive Graph). Before publishing the presentation on the Petal Diagram and Trade-off Map, I did a ‘quick and dirty’ customer development interview on the two tools. Both my wife and 12 year-old daughter opined that the Petal Diagram looks simpler and fun. However, when I outlined the features of the Trade-off Map, they agreed that the Trade-off Map has ‘more depth.’ So the jury is out. It would be interesting to hear your perspective of the Petal Diagram vis-a-vis the Trade-off Map (which is a reinvention of the classic Competitive Graph). Our favorite aspect of this is that it honors what we know about innovation: It generally happens at the intersection of existing disciplines. It follows, then, that one’s market definition would be at the intersection of legacy markets. Steve – like the Petal Diagram approach – and the comments that your blog topic has drawn from savvy, respondents. We prefer not looking at competitive influences – we are focused on our own game – not the competitors’. And…on and on – the rationale goes. All an avoidance – that eventually results in getting run over, by the bullet train – and sometimes not even realizing it. Somehow, it has become fashionable not to be concerned about competitive movements. Some – even suggest attempting to develop relationships and leverage the competition – is the right way to go – in this open & global economy. Not solely traditional – although this is bunk and borderline insanity. Especially, in this continuing tough-as-nails, market economy. cope with it – not just in the short-term or reactively, as a key element of their Corporate Development. We practice what we preach, when we use the term “Market Warfare” and have authored a book – primarily, a Marketing Cookbook – that shows “how to” apply these fundamentals to critical areas of the business. How does your firm stack-up? Are you victim or victor? An acquaintance angel investor posted the link to this post on Facebook, and since I’d come at this from a 180-degree different perspective, I figured I might as well type out the view from there. (My first job out of college was at a Top 100 agency writing copy — that had to “move the needle” — for Fortune 500 accounts.) I’ll be addressing another market/audience of readers. Another petal, as it were. So, is the writer saying that the concept of a single product competing against multiple and diverse alternatives is new to him, and that he himself hasn’t launched many new products where the emphasis is on advertising-to-educate? So then, he’s come up with his flower idea as a first step to starting to understand what’s new to him, and then sharing it with everyone else who’s also unfamiliar with the concept and will be pleased to discover it, themselves? Well, he could always research the marketing approaches carried out by marketers in any of his five petals, because they’ve obviously been existing, for decades, in the very same environment he’s wandering around in trying to map. His offering will now be one of THEIR petals. They’re all already expert at competing in multiple markets, and they’re each aware that he’s recently sprung up and have likely been evaluating his potential ability to erode market share, and his strengths and weakness, etc. They’ve been fighting a war on multiple fronts — and allotting resources, according to the potential to make headway or need to defend territory, as appropriate — for a long, long time. They could then explain to him that, sure, the bankers are very different from the low percentage spec investors, because the bankers are going to say, “Show me you knew enough to take on ONE of your petal audiences, there, and won market share away from them and can do it again, at a larger scale, with more funding. Don’t tell me you just has this incredible epiphany that you’re positioned to have to compete against multiple and diverse alternatives at once, each represented by a petal, because that makes it sound like you just now figured out where you are and can’t wait to show the world you know. To the bankers, it’ll be like he’s come up with an infogram to help make very clear just how speculative the speculative investment is, and why. (Even the “No, it’s YOU who doesn’t understand!” is SOP in this situation.) And at that, the whole presentation is extremely clear and very convincing. Question in terms of the petals, could you weight the size of the petals by the size of the market or is it taking it too far? Very helpful. We use this for our startup Novi Securty (www.getnovi.com) and have had good success communicating to investors / partners the state of a saturated security market and how we are going to differentiate ourselves. 100% right that in the old style chart every company claims to be up and to the right. The Petal Diagram is interesting, it is not entirely dissimilar from a radar chart/spider chart. Perhaps for a detailed competitive analysis of each company a spider chart can be used. This would summarize the position of each competitor at a glance and help determine where to place each company on the cumulative chart—the Petal Diagram. The deep dive info can be used internally or placed in the appendix to be used on an as needed basis. These diagrams are very interesting, you can find more diagram examples in Creately diagram community. There are 1000’s of templates for each diagram type.